Hyacinth's china pattern, described as "Royal Doulton with the hand-painted periwinkles", is actually a pattern called "Braganza" and was manufactured by The Colclough China Company. The Colclough China Company was founded in 1890 and was taken over by Royal Doulton in the early 1970s. The Braganza pattern was discontinued in 1992, and production under the Colclough name was discontinued in 1996. Two cast members died within two months of each other in 1998. Mary Millar (played Rose from 1991 to 1995) on 10 November 1998 due to ovarian cancer. George Webb (Daddy) died on 30 December 1998, of natural causes. Exterior shots around Hyacinth's house were taped in Binley Woods, Warwickshire, a village east of Coventry. Bucket's Residence Street View. Exterior shots around Daisy and Onslow's council terrace were taped in Stoke Aldermoor in Coventry. Onslow and Daisy's Street View. Other exterior street and town shots were taped in Leamington Spa, and in various towns throughout Warwickshire, along with many scenes from the large town of Northampton. Some scenes were also shot in Swindon, Oxford, and Bristol. The "FH" on Onslow's hat stands for "Fulton Hogan Ltd.," a New Zealand asphalt and road-building company. When Geoffrey Hughes was there promoting a show, he was given that hat by one of the company's truck drivers. 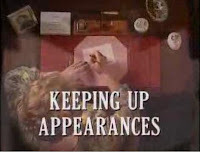 The character Richard (Hyacinth's husband – a main character in the original show) is frequently referred to (Hyacinth addresses to him off-stage, talks to him on the phone etc. ), but does not actually appear in the production. The main plot of the show revolves around Emmet directing a play at the local village hall, when Hyacinth is cast in the play's leading role disaster is in the making. David Janson, who occasionally plays the mailman, replaced Richard Gibson in the role of "Otto Flick" in the last series of "'Allo 'Allo!" 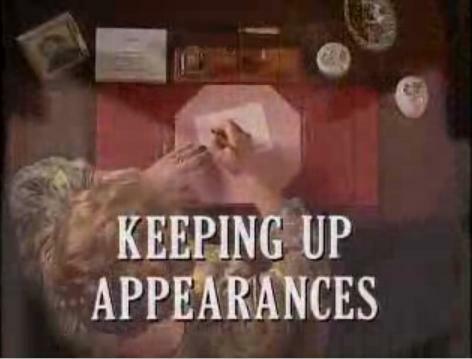 5 Actors from Keeping Up Appearances also appeared in episodes of "Dr. Who." Jeremy Gittins (The Vicar) once played "Lazlo" on an episode of "Dr. Who" in 1981. "The Doctor Who" episode Clive Swift (Richard) was in the "Dr. Who" Episode "Revolution of the Daleks." It was Adventure #142 from 1986. Clive played a character named "Jobel." Judy Cornwell (Daisy) played one of the cannibalistic "Rezzies" in the 1987 "Dr. Who" story "Paradise Towers." Geoffrey Hughes (Onslow) played "Popplewick" in the fourth installment of "Dr. Who's" "Trial of a Time Lord." David Griffin (Emmet) played "Lt. Commander Mitchell" aboard the submarine in the 1972 "Doctor Who" story "The Sea Devils." In one episode Onslow and Daisy are in bed reading, conversing about DIY when Onslow describes himself as being more intellectually than manually gifted. During this time, he is glancing at a hardbacked book, the title of which is difficult to see on screen. The book is a newish copy of "Principles of Condensed Matter Physics." The age order of the four sisters is Hyacinth, Daisy, Violet, and then Rose. In real life the order goes Patricia Routledge (Hyacinth), Mary Millar (Rose #2), Anna Dawson (Violet), Judy Cornwell (Daisy), and finally Shirley Stelfox (Rose #1). Two cars played the role of Hyacinth's and Richard's. They were both the same type of car - a Rover 216 in the same shade of blue. Early episodes used a car with the registration plate D541 EXL. Later ones used a car with the registration plate D541 EFL. Ironically, while Hyacinth brags to Elizabeth in nearly every episode when Violet calls that she (Violet) has a swimming pool, the house used as Elizabeth's in the show actually has its own swimming pool in reality. This of course was never featured onscreen. Geoffrey Hughes (Onslo) was diagnosed with prostate cancer in 1996 but recovered. In 2010 the cancer returned and he had to retire from acting. Geoffrey Hughes (Onslo) In 2009, he was appointed Deputy Lord Lieutenant for the Isle of Wight, making him 'the official link between the island and royalty at formal engagements'. Clive Swift (Richard) studied English Literature at Cambridge Univeristy. Josephine Tewson (Elizabeth) Played a nanny in a 30-second commercial for Nabisco Fruit Newtons in the USA in the late 1990s. David Griffin (Emmet) is fluent in French and is married to a French woman, they have 2 children together. I always like how Onslow rocks a sweater vest with no shirt on underneath and he quite often is reading some high-level science textbook in bed. Great post! Clive Swift was also in "Voyage of the damned"
with David Tennant and Kylie Minogue. I cannot think of a more wonderful, laugh out loud series. I don't care that it is an ongoing and repeated plot. I truly have never "belly" laughed before. I watched it to get over my anxiety before a knee replacement surgery. Whenever I watch the show, I do actually get a smile on my face and a big chuckle out of the whole thing. I watch it on Netflix and have seen each episode at least three times now. Some shows get old (outdated), but this one never does. David Griffin also played a submarine commander in "The Goose and the Submarine" on "'Allo 'Allo"
Did the son (Sheridan) of Hyacinth and Richard ever make an appearance on any of the shows? Sheridan's only appearance was the back of his head in silhouette in the back of a cab as it pulls away from the Bucket residence at the beginning of an episode. Clive Swift made a brief appearance as a knight at the beginning of the film "Excalibur." Did he ever look different from Richard Bucket!!! Hyacinth also played in the orginial movie " To Sir With Love." She was really young! It brings a huge smile on my face whenever I watch an episode..and looking forward to another! Britcoms hit the US many years ago and it was a big boost for BBC programs. Most of them were very popular in Europe on their own but one program in particular was in turn-around. And I can tell you a lot of PBS stations in the US were livid over it. I remember when Vicar of Dibley first aired in the US. It was a runaway hit with our viewers. As you know, in the US you have to raise money to buy programming. We already loved Dr. Who and Mr. Bean. Of course Mr. Bean went full bore commercial over here and left PBS. So when Vicar arrived, it was a smash hit. Then came an announcement by OETA's president about the serious. He advised that they only produced 6 episodes total and there would be no more. This didn't ring well all over the US. It rumbled in a wave all the way to England where they quickly brought back the cast with Dawn French being contracted back by French and Saunders. The re-boot was on and it came back to make 14 more episodes. Us Yanks are good for something after all.